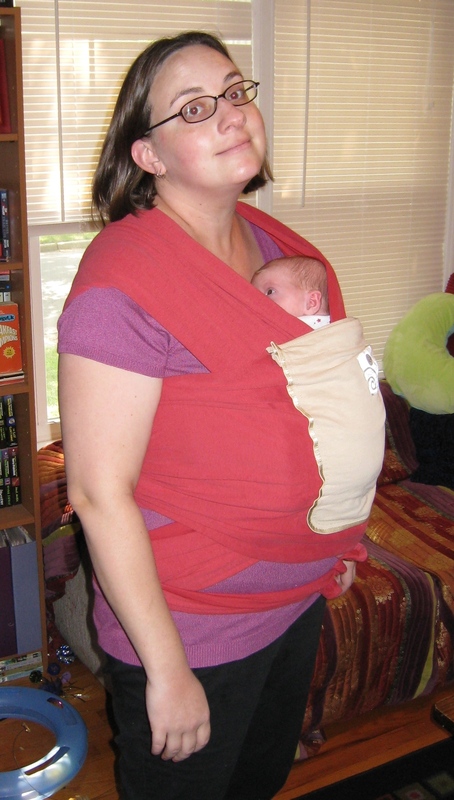 Our friend Scarlett is a baby-wearing advocate and she recommended the wraparound baby carriers at Cotton Cradles where we picked out our Hug-a-bub. It’s basically a long stretchy piece of fabric that you use to tie the baby on to yourself, but we already love using it to take walks around the neighborhood and Kivrin immediately falls asleep when she is snuggled up next to us inside it. My favorite part is the instructional DVD – because the Hug-a-bub is from an Australian company, the woman in the video has a lovely accent and she makes tying on the fabric seem sophisticated instead of frustrating, especially the very first time. You guys are looking good in that wrap! Baby Kivrin is so cute! We’ll have to get “the girls” together sometime soon.